Which instructor has never dreamed of doing a full real-time, real-life simulation session when teaching a group? CORYS has been working on this challenge with a number of American clients. The result is two new tools – SmartBoard and SoftSim. These were presented at the Spring 2013 Users Club event. SmartBoard, designed for instructors, is an interactive touch board on which several screens from the fullscale simulator are displayed side by side, for example the track, controls, the dashboard and the route description. The instructor behaves as they would on the real simulator. A vertical menu is used to change screens. The instructor station can also be displayed – all at the touch of a finger. SoftSim, designed for trainees, features a console that includes a laptop computer and two large-format LCD screens: one to display the track, and the second – a touchscreen – to emulate the train controls. 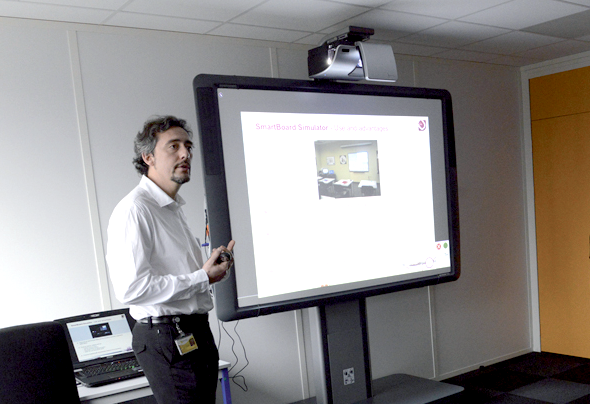 It can also be connected to the SmartBoard to display the instructor’s demonstrations. The solution marks a huge step change compared to traditional training – switching from a static to a dynamic situation, from theoretical to real situations and from passive listening to interactivity. Those not yet familiar with the fullscale simulator get to see the screens. If the network operator has specific images of their tracks, these can be displayed. In short, classroom lessons have now reached an unparalleled level of immersion. Applications for these new resources include presenting an introduction to the basics of driving, preparation for sessions on the simulator, training for sub-systems and new procedures, and so on. Instructors can also create scenarios and train trainers without having to use a fullscope simulator. SmartBoard and SoftSim are designed firstly for operators that already have simulators. In such cases, the investment (apart from for the hardware itself) is confined to reconfiguring the simulation software for the relevant screen formats. In the United States, Union Pacific uses a similar solution which is installed in - trailers that crisscross the country and take training to the trainees.